Located 1,530 miles southeast of Miami, Fla., the island of Grenada was sighted by Christopher Columbus in 1498 on his third voyage. It changed hands repeatedly between the English and French during the colonial era, becoming a profitable source of sugar grown on plantations worked by African slaves. Only 133 square miles in size, Grenada had a population of almost 100,000 in 1983. It was the world’s second-largest producer of nutmeg, and exported workers to the United States, Canada, and other Caribbean islands. And in 1982, the politics of the island that led to Operation Urgent Fury were, to put it mildly, complex. Sir Eric Matthew Gairy, the first prime minister, was overthrown in a bloodless coup led by Maurice Bishop on March 13, 1979. 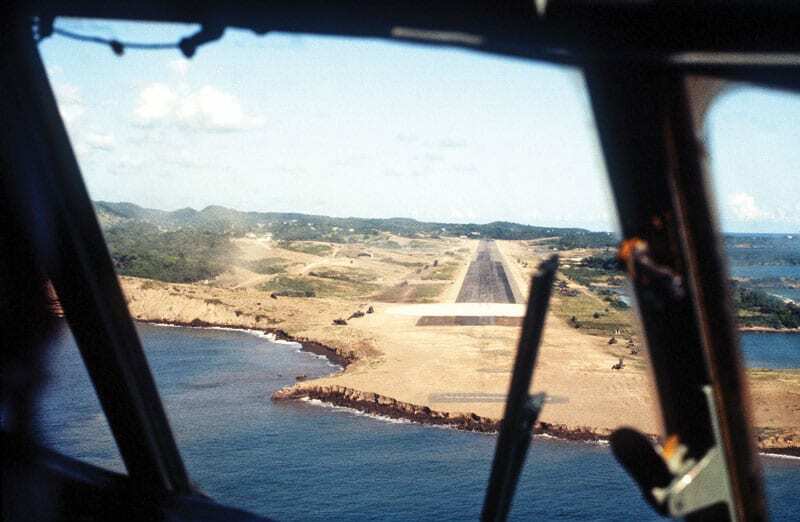 His “People’s Revolutionary Government” ruled by decree, and quickly formed close ties with Cuba and the Soviet bloc, much to the displeasure of the Reagan administration in Washington, D.C. An economic handicap for Grenada was the inadequate runway at Pearls Airport: too short for big jets. The lucrative tourist trade went to islands with better airline connections. When the United States and Western nations refused to fund a new 9,000-foot-long runway at Point Salines on Grenada’s southwest tip, Cuba sent construction workers and earthmoving equipment to complete the project. In Washington, military planners worried that Point Salines could become a base for Cuban planes delivering weapons to guerrillas throughout the region, or even for Russian combat aircraft. Another concern was St. George’s University School of Medicine, where some 600 American students were enrolled on two campuses in 1983. In Washington, officials worried that the students could become hostages in a crisis, like the Americans who had been held in Iran from November 1979 to January 1981. 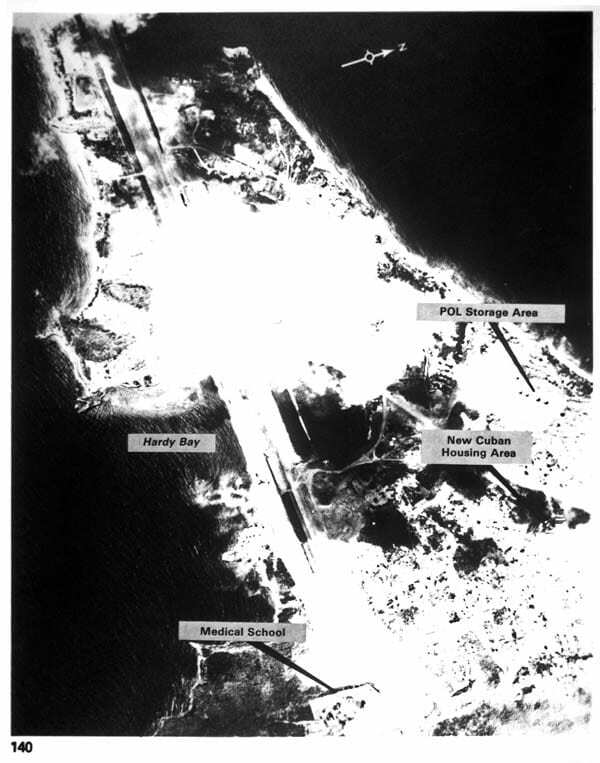 A DoD-released image of objectives surrounding Point Salines Airfield. DoD/2 Soviet Military Power, 1984. On Oct. 17, an interagency group met at the State Department to consider options for a “noncombatant evacuation operation” (NEO) in Grenada. By Oct. 20, a White House “crisis pre-planning group” decided that the situation was serious enough to convene the National Security Council’s “Special Situation Group” chaired by Vice President George H.W. Bush. There was no contingency plan on the shelf, no up-to-date intelligence, not even a good map of the island. The best map available was based on a 1936 British Admiralty navigation chart! To reduce the risk of leaks, everything connected with the operation was classified top secret – but these “special category” restrictions would cripple subsequent planning. Since the Caribbean was then in the area of responsibility of the U.S. Atlantic Command, Vice Adm. Joseph Metcalf III, commanding 2nd Fleet, was given overall command of the force designated Joint Task Force (JTF) 120. Chairman of the Joint Chiefs of Staff Gen. John W. Vessey Jr., sent Maj. Gen. H. Norman Schwarzkopf Jr., to serve as ground operations adviser to Metcalf.